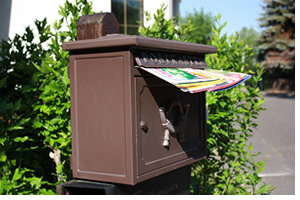 To help us understand how commercial mailboxes got to be where they are today, it’s helpful to take a look at the not-so-distant past. You see, the major changes for us happened in the middle of the 19th-century. It’s safe to say that before the 1850s, mailboxes, as we know them, weren’t in existence just yet. That all changed with the postal stamp, which replaced the need to pay for postage at a local post office. People really enjoyed their letters to each other. New styles and designs were invented to accommodate the growing use of the mailbox, aiming to be both practical and attractive at once. Of course, mail (or the general delivery of messages) goes way back in ancient history–long before our 21st-century. For this article, we’ll stick to those details that brought about the commercial mailboxes that we use today. It wasn’t until the mid to late 1800s that people could send mail without having to pay a delivery fee. From messages between families and friends to news delivered to remote places, the mail system was a big hit far and wide and kept on growing. Sometime in the early 1920s the government set mandatory rules for the size of the postage mailbox. Everyone with a mailbox would then have equal access to news and communication. Mailboxes evolved into mailslots in doors, mail canisters fastened to the wall outside, and the most common type, the tunnel style. This tunnel style–named for the tunnel shape of the box–is a staple in suburban homes around the nation. The U.S. Postal Service made it mandatory for houses to have mailboxes and be big enough for magazines while withstanding the elements. But what about those mailboxes used in places of work? Large corporations didn’t use to be made up of employees who required individual access to mail. This privilege was reserved for top-level individuals. But that changed a lot the closer we got to the 21st-century. Soon, large locked boxes the size of crates were installed into commercial spaces that accommodated large volumes of papers, magazines, and packages. In larger corporations today, businesses may assign individual lockboxes to employees. The businesses’ post office essentially moved to their corporations. Places like apartments and condominiums also had to install mailbox units for their residents. The need for larger units grew and grew to the commercial units we know today. To accommodate the growth, new styles of mailboxes were developed. And to save space, new techniques of storing mail were also developed, such as the horizontal “stackable” mailbox. In this method, the typical tunnel style is traded for a slim container wide enough for a folder and tall enough for a stack of envelopes. These commercial mailboxes are typically recessed and made of a heavy element like aluminum. Usually, a few larger mailboxes for packages are set at the bottom of these units in case a big package isn’t delivered by-hand to a company. Mailboxes had to not only update their volume capacity, they also had to improve their style to fit in with modern design. Since the turn of the century, the stacked style has been prevalent in post offices and corporations alike. As for the look, designs and decorations are traded for flat and utilitarian mailboxes with gray, metal doors. Nowadays, we worry about two things: Space and safety. If there’s space for all and doors are secured, it’s good enough for the 21-st century. If you’re looking for your own commercial mailboxes, browse our product offerings that vary based on your company’s individual needs. For more information and helpful insight, visit the National Mailboxes blog and browse our article listings!